We’ll be preparing monthly summaries of meetings and milestones over the first phases of transformation. Read the October summary here. Would you like to be part of transforming Colorado's public and environmental health system? Are you willing to dedicate your time, talent and expertise to help guide the process and make decisions along the way? Then you should apply for Colorado’s Public Health Transformation Steering Committee! We are interested in balancing representation to include rural, urban and mid-sized health departments, along with state agency programs and other public health partners (e.g. previous legislators, academia, nonprofit organizations). Additionally, we are committed to selecting candidates who identify with underrepresented populations and will work to ensure everyone's voice on the steering committee is heard and valued. If you don't have the time to participate on the steering committee but are interested in helping select the members of the committee, please email Theresa (Tracy) Anselmo. Thank you so much. We look forward to hearing from you! Apply here by Wed., Nov. 21, 2018. At last week’s quarterly meeting of the Colorado Directors of Environmental Health (CDEH) in Grand Junction, the state’s local environmental health leadership began deciding how EH capabilities and services should be fully defined in statute. They also discussed how the public and policymakers perceive environmental health in general and its relationship to public health. These definitions, once finalized, will inform the 2019 cost assessment that will determine how much it costs to assure these capabilities and provide these services for all Coloradans. They will also be an integral part of policymaker and stakeholder education as we move forward with transforming Colorado’s public health system. Tom Gonzales, who is currently a deputy director at El Paso County Public Health, has accepted the position of Public Health Director for Larimer County Department of Public Health and Environment and will start December 3. He is succeeding Dr. Adrienne LeBailly, who is retiring after serving as PH director and medical director for 31 years. Congrats, Tom! Recognizing their ardent participation in federal-level advocacy, NACCHO awarded TCHD their first ever Advocate of the Year for a local health department. NACCHO specifically called out the department’s efforts to engage Colorado’s national representatives, including tours of the department. Read more here. The San Luis Valley Public Health Partnership won for their collaborative regional disaster health response system. The model practice awards saw two Colorado winners: The Metro Denver Partnership for Health and El Paso County Public Health (for their video recorded directly observed therapy). Congrats all! 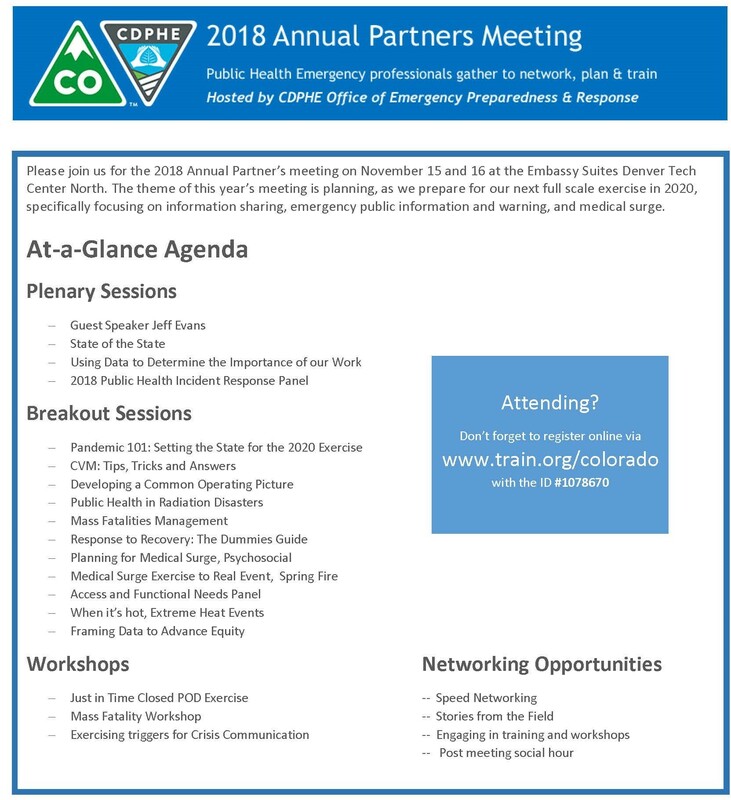 CALPHO is fortunate to partner with Denver Public Health in offering this workshop, How to talk Health Equity, that will introduce participants to the most effective ways to talk about inequities in health outcomes and how to build support for programs and policies designed to create more equitable health systems. This will inform our ongoing efforts to increase recognition of public health and illuminate the connections between the public health services people value and the agencies that deliver those services and protections. The workshop is Tuesday, November 13th, 1-4:30. Read about workshop instructor Jennifer Nichols here. Please email Tracy Anselmo if you have not received an invitation to attend so we can have the room set up appropriately. Communicating effectively about the value of public health is more difficult when “False Narratives” remain unchallenged. As we hosted two focus groups on communicating the value of public health this week, I ran across an OpEd in Colorado Politics that was both disturbing and enlightening, and perhaps a perspective that we need to consider as we frame our messages about public health. I encourage you to read “There are lies, damn lies – and social media” and ponder what this means for public health as we work on creating our own narrative, while combating false ones. And no one can escape the fact that it’s election season. One only need turn on the television or, even worse, play Word Crossy on their phone (who me???) to get bombarded with political ads spewing nonsense and mis-information aimed at swaying voters to approve or defeat some candidate, amendment, or referendum. Amidst all of this noise about what politicians and campaigners think we should care about, The Colorado Health Foundation in partnership with the Kaiser Family Foundation asked more than 1,800 Colorado voters about their views on a wide range of issues leading up to the 2018 midterm elections. Top on the list, education, health care, and housing costs. Their entire report along with some additional resources can be found here, and it is worth a read through as we frame our messages about and how, ultimately preventing diseases save on costs of health care. Finally, Shannon Kolman and I were fortunate to attend the Network for Public Health Law conference in October. The highlight of the event for me – besides running into some Colorado folks from Pitkin, Tri-County and Jeffco – was the keynote address by Sandro Galea. He outlined 10 things we need to do when we talk about health in order to change the narrative. His provocative stories (like What killed Blind Willy Johnson?) and compelling data are perhaps the start of how we should talk about health. Watch his presentation here, and download the slides to follow allong. NACCHO is accepting applications for the 2018-2019 Water, Sanitation, and Hygiene (WASH) Emergency Preparedness and Response Workgroup. The workgroup will provide participants with the opportunity to connect with peers from LPHAs across the country to share their experiences preparing for and responding to WASH emergencies, identify common challenges in responding to WASH emergencies, share resources and tools used in WASH emergency response, and evaluate how existing tools can be improved to better equip health departments. Learn more and apply here. NACCHO is now accepting applications for the 2018–2019 Model Practices Program. The program honors and recognizes outstanding local health initiatives from across the nation, and shares and promotes these practices among local health departments through the Model Practice Database. Listen to the Model Practices webinar recording for details on the application process. There is no limit to the number of awards given. Online submissions must be received by 11:59 ET on December 12, 2018. Submissions can be made online here. This survey, a project by GP RED (Research Education and Development for Health, Recreation, and Land Agencies), aims to enhance our understanding of how local government agencies are handling unauthorized camping in public parks. Share your agency’s approach to this complex public health and safety challenge. Take the survey here. Maximize SNAP and WIC enrollment to propel Colorado to become a leading state in enrollment in these health and nutrition benefit programs. This is a critical goal area and they are hoping for a diverse mix of state agencies, nonprofits, healthcare systems, community leaders, and people with lived experience. Please contact Jennifer Banyan at R-Evolution Consulting if you are interested. Equity has become a hot topic in planning over recent years. Much thought and research has gone into how planners can address equity in the planning process, but how effective are these efforts? Is “equity planning” the latest trend or an issue that’s here to stay? On November 7, join the CU Denver Masters in Urban Planning (MURP) Department and Alumni Association for a lecture and panel discussion about what equity means for the field of planning. Hear from local and national experts in housing, health, and transportation planning, and learn specific tools and techniques that can be used to incorporate equity thinking into your everyday planning practice. Register here. Despite the failure of proposed bill in the Legislative Council Committee vote, there is still hope for some additional state funding for LPHA opioid activities. On Monday, October 15, the Legislative Council Committee considered and voted on all bills forwarded to them from each Interim Committee. The results were not necessarily expected and were different than most years when the Legislative Council Committee most commonly approves every interim committee bill. Partisan politics related to the election and the cost of some of the bills resulted in their demise. Several bills failed on a party line vote (a tie vote means a bill does not pass; this Committee has an equal number of Democrats and Republicans). At the Colorado Consortium for Prescription Drug Abuse Prevention Annual Meeting last week, Representatives Kennedy and Singer assured the audience that immediately following the Legislative Council Committee vote the study committee members reserved bill titles for the opioid bills that did not pass out of committee, and Representative Kennedy specifically mention LPHA funding as an item of importance in one of the failed bills. Jennifer Miles and Frontline Public Affairs will continue to follow Colorado’s opioid legislation and look for opportunities to highlight the value of public health as part of the solution. APHA's Annual Meeting and Expo is the largest annual gathering of public health professionals. More than 12,000 people attend, and thousands of new abstracts are presented each year. CDPHE’s Office of Emergency Preparedness and Response (OEPR) is hosting its annual meeting of the Public Health and Medical Advisory Committee (PHMAC) Novemebr 15-16 in Aurora. Colorado Counties, Inc (CCI) hosts this gathering of county commissioners and local government professionals from across the state. Registration now open. Hosted by Civic Canopy, The Summit will provide a space where diverse perspectives can unite, engage in productive dialogue, and collectively act to solve the complex social issues we face. LiveWell Colorado’s HEAL Summit is the premier annual convening that brings together Healthy Eating and Active Living (HEAL) leaders from throughout the state of Colorado and beyond.